Atpūta pie jūras. Atpūtas vietas pie jūras.Atpūta Kurzemē. The surroundings of our holiday home are perfect for taking a stroll as beautiful scenery awaits you in every direction – sea, forests and uninhibited nature. There are several well-kept and marked trails in the Slītere National Park and its area. Each trail has something unique to offer! Everyone will find the most suitable path for them – a nature trail through the Park, short stroll through Mazirbe town, or a longer, few-hour hike along the seashore. These walks will allow you to fully immerse yourself in nature and enjoy this picturesque and historic area of Northern Kurzeme. The Baltic Sea invites you to experience its wonders throughout the year. Mazirbe beach offers you a respite from the city crowd. It is a place where you can bask in the sun on a half-empty beach, go on bike rides or simply take a walk. If you are an adventure seeker, you’ll have the amazing opportunity to engage in search of amber and other surprises washed out by the sea (but be aware of false amber!). Fishing enthusiasts will be able to try their luck in the Baltic Sea or the nearby Mazirbe River. For lovers of athletic activities the beach offers the possibility to play volleyball. During windy weather the beach is frequented by enthusiasts of wakeboarding, kite boarding, and other active water sports. Holiday home “Mazirbes Dzelmes” is the perfect place if you are a fishing enthusiast and even if you have not tried your luck with the fishing rod – the holiday home offers great opportunities for fishing in the Baltic Sea and the nearby Irbe River. When you are vacationing so close to waters, it would be folly not to try your hand at catching a salmon, sea trout, or a vimba. Moreover, during autumn-winter season you would be able to go to sea for flounders – a favorite pastime of many local fishermen. The Irbe River is an excellent fishing site as well – throughout the whole year it offers a broad range of underwater fauna. Furthermore, fishing is not a solitary activity – you can make it an activity for the whole family of group of friends. Those not fishing can enjoy all the qualities of the beach – walking, running, contemplation or meditation accompanied by the sounds of sea. And when the fishing is done you can enjoy the catch in an outdoor meal together. Livonians – one of the Finno-Ugrian nations of the Blatic Sea region once inhabited large part of the territory of Latvia, mostly in Northern Kurzeme and Vidzeme regions. As a homogenous ethnic group Livonians have survived the longest right here in Norther Kurzeme – an approximately 60 km [~ 37 miles] long and 2 – 5 km [1,2 – 3,1 miles] wide stretch on the Baltic Sea shore. Between towns of Ovīši and Ģipka 12 Livonian villages remain: Ovīši, Lūžņa, Miķeļtornis, Lielirbe, Sīkrags, Mazirbe, Košrags, Pitrags, Saunags, Vaide, Kolka and Melnsils. During Latvia’s incorporation in the Soviet Union, Latvian seashore as its most outward border gained special strategic significance and the Livonian villages were “pushed out” by military surveillance towers, border guard posts, and other military facilities. Nevertheless, these 12 villages have managed to survive till today. There you can learn more about the history and culture of the Livonians, visit an authentic Livonian tavern and the Livonian Community House, and traveling further through the Dundaga province you’ll be able to see other state-protected Livonian cultural monuments. Mazirbe is ideally located if you wish to travel around the Northern Kurzeme region. 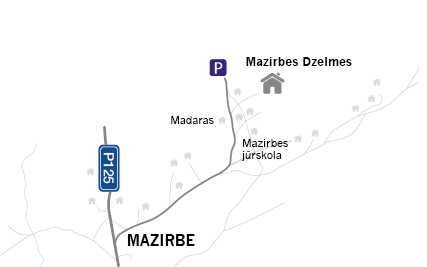 If you are coming to Mazirbe from Riga, take the highway along the sea shore (P128, P131, P124) and you’ll have the opportunity to see fishermen’s villages of the Gulf of Riga and the beauty of Latvian seaside. 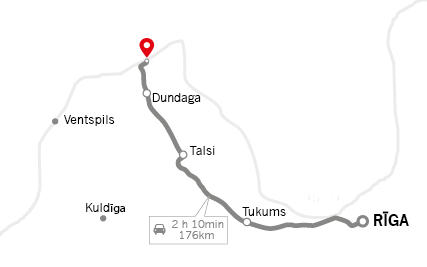 In Mazirbe area you can choose one of the prepared routes to visit the Livonian Coast, Slītere National Park or any other of the beautiful natural sites in the vicinity – the Cape of Kolka, Rīgzeme Grand Oak, Dūmele Stone, Kaļķupe Valley, Puiškalns and many others. Only an hour from Mazirbe is Ventspils, one of the most progressive cities in the country with countless recreation possibilities. You’ll need only 20 minutes to reach Dundaga city to see its 13th century castle, which is the largest in all of Northen Kurzeme. The nearby city of Valdemārpils also offers memorable cultural and historic delights. Staying in Mazirbe gives you an excellent opportunity to combine relaxation by the Baltic Sea with active recreation in Irbe River. This river that gave name to the nearby Lielirbe village has many twists and turns and is recognized as one of the most interesting rivers in Kurzeme region. And it’s only a short drive away from Mazirbe. Due to its serpentine and secluded nature it has become one of the favorite rivers of water tourists and boating enthusiasts. The river is rather slow thus it is possible to view its sandy and steep banks, and it also has plenty of gently sloping places for resting. Through centuries lighthouses have gained almost mythical significance as beacons of safety and hope and sentinels against threats. Seafaring and fishery has always been an integral part of the Northern Kurzeme coastal inhabitants’ lives, therefore lighthouses in this area are a common sight – one can find more than 9 lighthouses from different historical periods of Latvia. In the area around Mazirbe, from the Cape of Kolka to Ventspils, there are 6 lighthouses – lighthouses of Kolka, Šlītere, Sīkragciems, Miķeļtornis, Oviši and Irbe. Each one of these lighthouses has some special quality – one of them is built on an artificial island, another is the highest one in the Baltic States, yet another is the newest one in Latvia. These lighthouses are not only important objects of architecture – they also offer information about Latvia’s lighthouse and seafaring history. It is possible to climb most of these lighthouses, and, if there is such a wish, to hire a guide (previous arrangement necessary though). The Cape of Kolka – the most pronounced cape on Latvian seashore, where the Baltic Sea meets with the Gulf of Riga. Place of endless horizon, where it is possible to view both sunrise and sunset in the sea. You can spend whole day enjoying the sights and delights of the Cape of Kolka and Kolka village – watch the meeting of the two seas and the Kolka lighthouse 5 km [3,1 miles] into the sea, walk the trails of Kolka pine forest, visit Kolka village, taste the regional dish – sklandrausis – and smoked fish made by the local fishermen, climb the Kolka view tower, and discover this magical place through many other activities. If you are a bird watcher, visit the Cape of Kolka during spring when large amounts of birds returning from their winter flyway rest here – the cape is a part of the most intensive bird migration route in Latvia.